Our team answers homeowner questions every weekend on WCCO 830 AM from 9:00 am-10:00 am. Have your most pressing home improvement questions answered by calling 651-989-9226 or texting 81807. Here’s must-know information from our in-house deck specialist, Luke Panek, shared on 2.2.19. When a homeowner turns to our home improvement company for assistance with a deck building project, they’re pleased to learn that we’ll be with them every step of the way offering advice on materials and execution. 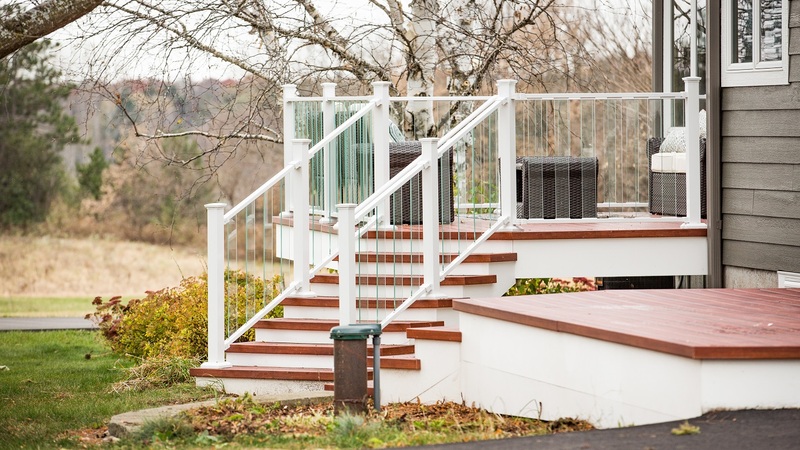 During the estimate process, we’re able to offer a customized plan that allows for the creation of a deck that’s a reflection of the homeowners’ taste, preferred material, and budget. Here are insights on planning a deck you’ll enjoy for years to come. Material: Overwhelmingly, Twin Cities homeowners seek out maintenance-free deck designs over wooden ones. The materials the homeowners we work with are drawn to are Zuri® Premium Decking by Royal and Azek®. Between the two, Zuri® has more of the allure of natural wood. Zuri® is also more durable because of its acrylic surface. Azek® has a less slick surface than Zuri®, which comes in handy in snowy and rainy conditions. Both brands are comprised of cellular PVC, making them absent of sawdust or wood flour, increasing durability over composite decking. True composite decking should be fully capped in order to avoid water penetration which can result in mold and mildew. Footings: The deck footings should also take into consideration the soil type they’re being placed on and the area’s climate. In the Twin Cities, Diamond Pier deck footings work particularly well. 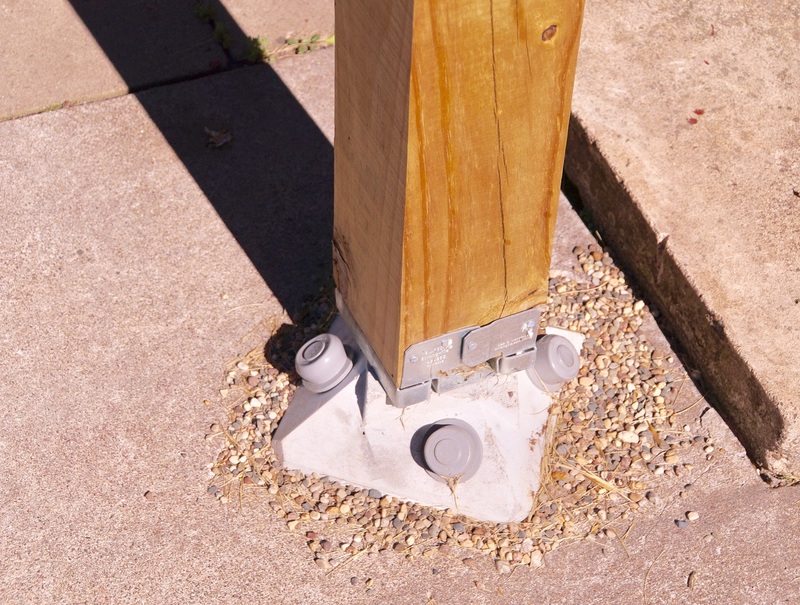 This pin foundation system has four pre-mortised openings that steel pins are driven through at 45-degree angles. They excel at maintaining their integrity during the annual freeze thaw cycle and can be installed without major excavation equipment. Railings: Even homeowners that opt for wooden deck boards are reluctant to install wooden railings because of the time commitment associated with maintenance. Maintenance-free choices are plentiful. One option for railing is metal cables. They allow for an expanded view. However, coated stainless steel railings come with an elevated cost. For decks high above the ground with horizontal metal cables, the aesthetics will be that of a wire ladder, which can prove unsafe for small children that may climb them. To address this issue, Fortress has created a vertical cable railing system. For homeowners looking to make a statement, glass panel railings are another popular option. However, it’s wise to remember that frequent cleaning is necessary to allow them to panoramic views. The exterior transformation of this 1880's Stillwater, MN home included improvements that lowered the homeowners' energy bills and enhanced the property's curb appeal. This Western Wisconsin couple's wish list included siding, decking, and windows. Their biggest request was that the materials be maintenance-free and attractive. Learn about the winning combination they chose! Here's why Karl opted to have us install gutters and decking on his newly constructed home. "Work well done and will use them again. The crew was very professional and friendly." - David N.
"We had Luke from Lindus come out to give us an estimate to demo our existing wood deck and replace it with a low-maintenance, composite deck. We were very impressed with his proposal and ordered one. The deck turned out fantastic. We specified treated lumber framing and Azek® for the decking and trim. Color coordinated steel railings and integrated stair and post lighting complement the project. The crew couldn't have been better. We are totally satisfied with the deck and with Lindus." - Gene R.
"The experience was great." - Judy K.
"It went well overall." - Chuck G.
"The workmanship and professionalism of your installation crews have been great." - Bruce V.
"So much fun to be in my new 4 season porch and watch my birds and flowers. Randy & Tristan, uncle and nephew, sure know to interact and of course, tear down and build it up again. I love looking at it all done." - Lynette T.